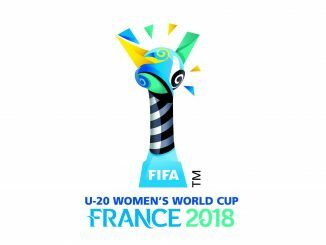 HomeBLOGS-General#U20WWC Fan Blog Day Three: Jamie Grubb gets behind ‘Allez Les Rouges’! “I guess you’re going to the same place as me,” comes a voice behind me in a southern English accent. Stood in a fairly remote local train station in northern Brittany this took me by surprise a little. How did this person know I was English? Oh yeah, the England shirt with Rianna Dean’s name across the back that I was wearing. Duh. 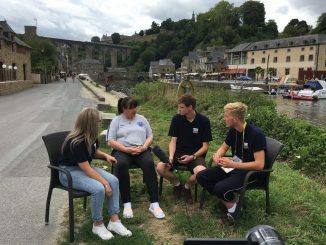 As we got chatting on the train to Dinan it transpired he was a Wales supporter (now exiled to Surrey), both men’s and women’s football, who had been researching next year’s World Cup, noticed there was an Under-20s World Cup taking place this summer and thought why not make a flying visit for a day and a couple of games. I liked him already. 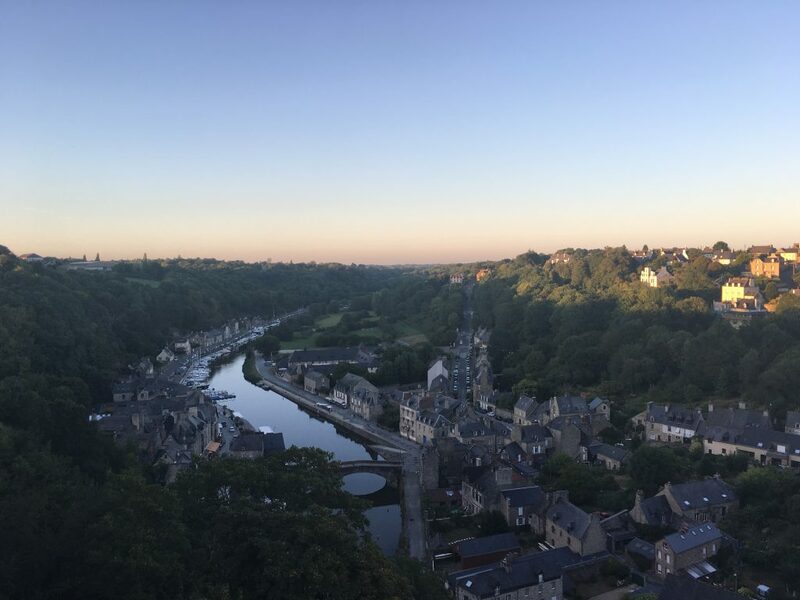 Once we got to Dinan I pointed the way to the stadium before heading into town myself. 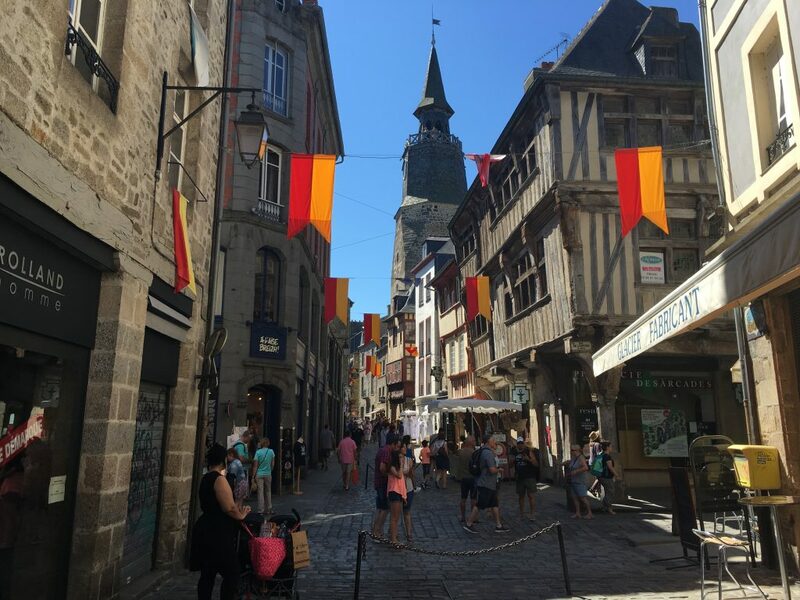 A bit more on Dinan itself as I didn’t say much about it the other day. It’s a fairly remote little town (in terms of the rail network – an infrequent single car service from equally small Dol-de-Bretagne) but simply stunning. The main junction in town next to the town hall leads up into a network of small cobbled streets with historic buildings and something new to discover at every turn. Restaurants spill out onto the pavements and there’s street musicians playing traditional French music all underneath wooden-fronted facades. The far side of town suddenly drops away into a valley with river at the bottom and stunning green vista. The official Brittany tourism website questions whether it is “Brittany’s prettiest town?” which given they’re the ones who’d know I’m assuming means it is. I wouldn’t disagree with them. 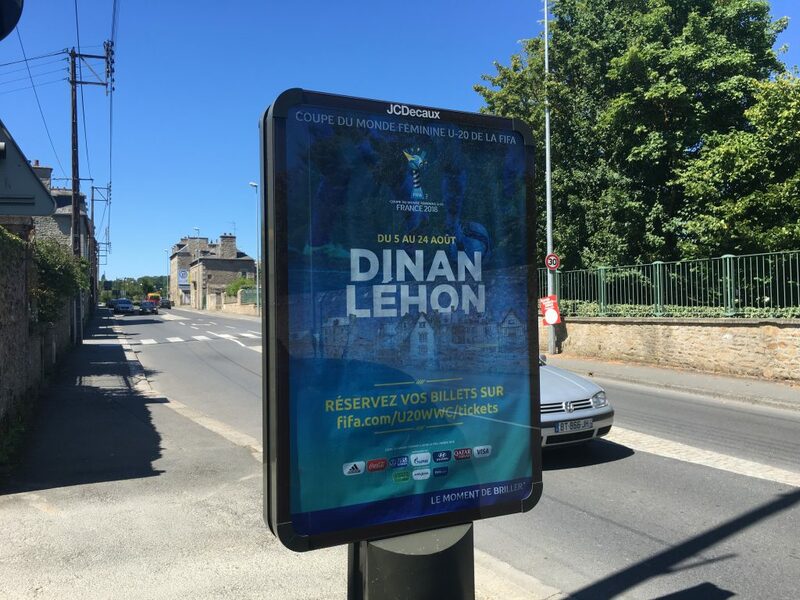 Anyways, no time to lose in Dinan as there’s the small matter of a Young Lionesses game to get to. 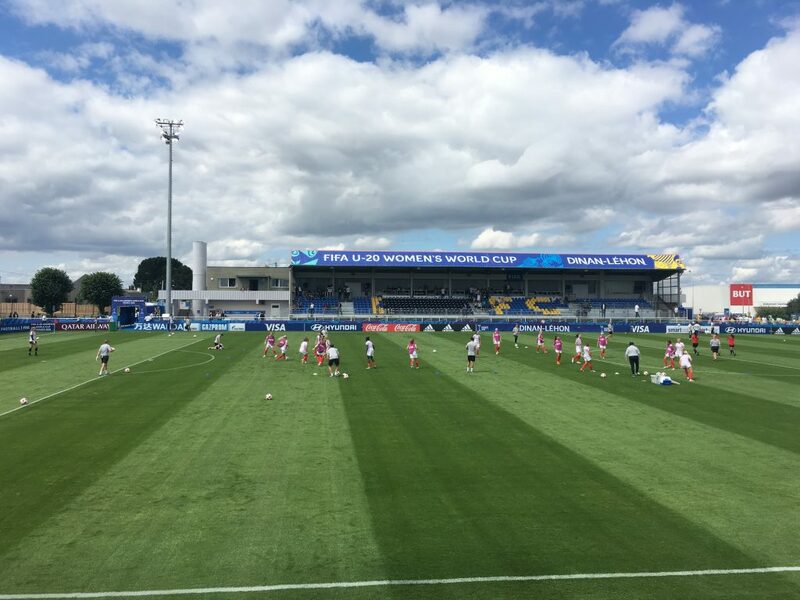 Unlike on Sunday we’re the first of the day’s double-header which feels a little like seeing the main band before the support act but it didn’t stop the England fans being in fine voice as camp was set up in the same place as the last game. 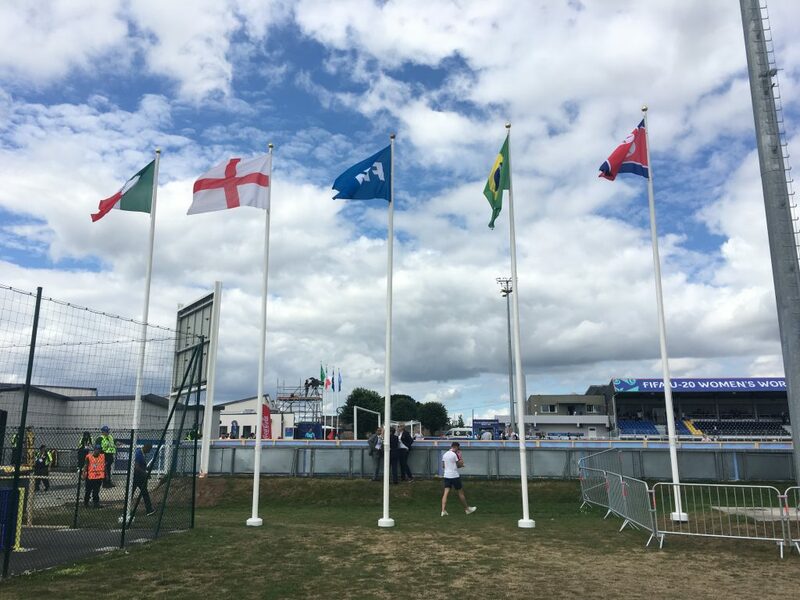 The stewarding here in France has been a bit over-zealous at times which for a senior World Cup I could understand but feels entirely unnecessary for this tournament. Once in the stadium you’re not allowed to move from the section you’re ticketed in, there’s a very thorough search on entry and you’re not allowed to bring much in either, certainly no water (meaning FIFA can charge you €3 a bottle once you’re inside with no other options for the next five hours) and there were reports the other day of suncream being confiscated, verging on dangerous given there’s little shade in some parts of the ground. You’ve also been allocated a seat on your ticket completely at random. 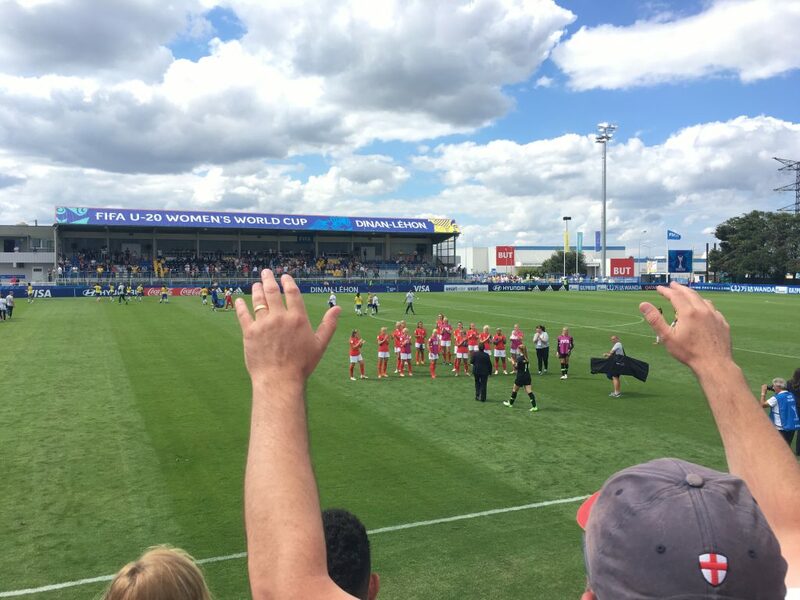 One steward did today try to move England fans into our “correct” seats (scattered across the stand) but soon gave up when she realised nobody was going to move anywhere, especially given her timing with the national anthems about to start. Plenty of seats for everyone! National anthem duly belted out, knights suited up once again and on with the game. The two days between the last fixture had evidently been put to good use by the England fans who had significantly increased their repertoire. From Sunday’s staple, an adaption of “Football’s coming home again” with Marley for Southgate the only lyric change (which quickly became a favourite of players as well as fans I understand!) today there were individual songs for Megan Finnigan, Alessia Russo, Chloe Kelly, Lauren Hemp, Sandy MacIver and others. Four rows of French schoolkids behind us were loving the atmosphere and got involved where they could, including their own rendition of “Allez Les Rouges”. Football bringing people together again. 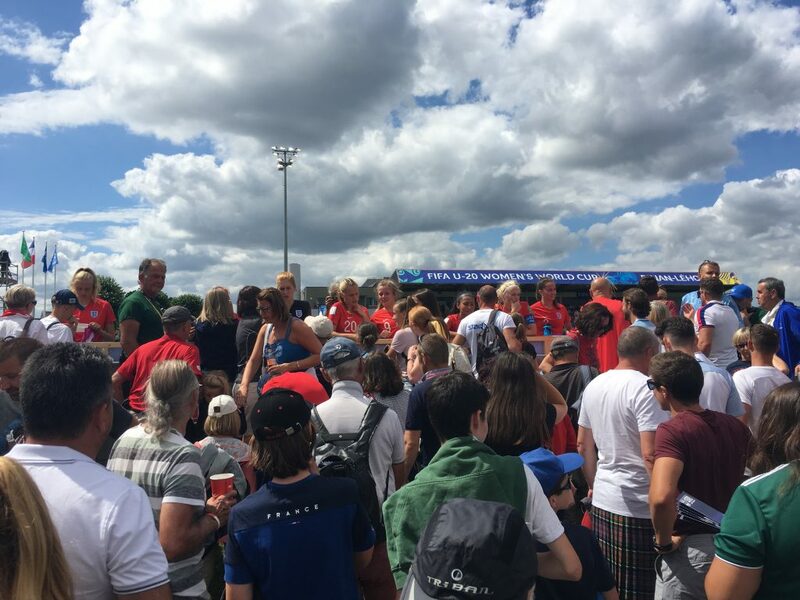 Things livened up further when Georgia Stanway blasted her penalty into the back of the net and as on Sunday the players ran along in front of the stand to celebrate. 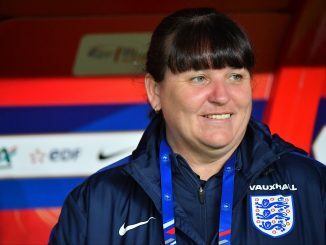 We were all well into the celebrations again as Anna Patten’s goal hit the back of the net and the realisation only came it had been ruled out as Brazil quickly restarted play. Confusion reigned in the stand as to the reason with it eventually concluded it must have been somehow offside. Where’s VAR when you need it? That second would have probably put the game to bed but Brazil were still in it, needing something to keep their World Cup alive. Sure enough their goal came at the death, but at the end whilst disappointing the mood seemed to be that four points from the two games and it still being in our hands was a good place to be. After the final whistle the families again got to spend some time with their daughters and sisters pitchside, in a slightly more controlled environment to the other day but no doubt quality time all the same. The families also got to spend some time with the players during their rest day in Rennes on Monday with is fantastic to hear. They’ve been out here a week and a bit of time with loved ones would have done as much good as a light training session for a couple of hours. Hopefully this will be replicated tomorrow to let the players refocus from today’s draw onto the all important Mexico game on Sunday. All that and we were only half way through the day. 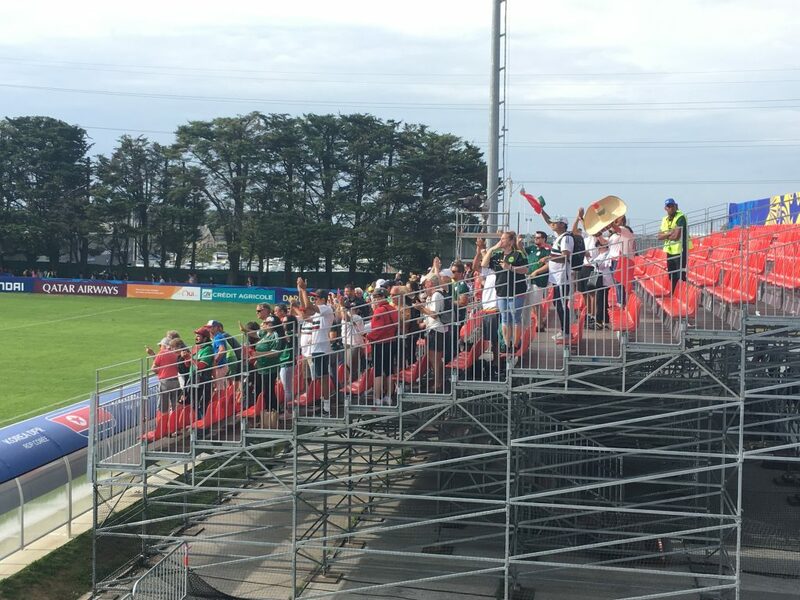 The second game was a much quieter affair in the stands, despite it being apparently an official “sell out”, with only a small pocket of Mexico fans making their support heard. Two early goals and plenty of open play meant it looked like being a high scoring encounter and whilst it was certainly end-to-end the promised goals just didn’t materialise with North Korea stealing it two one in the end. All to play for then heading into the last group games on Sunday lunchtime which both kick-off simultaneously. In the mean time it’s back to St Malo tomorrow for more Group D action ahead of two rest days leading us into the final round of group games. Let’s go!